What Are Forum Plugins and Why Should I Use One? WordPress forum plugins integrate forum functionality into your website allowing you to set up a versatile platform for different users to collaborate on. They’re incredibly easy to setup and they bring a plethora of powerful options to the table. 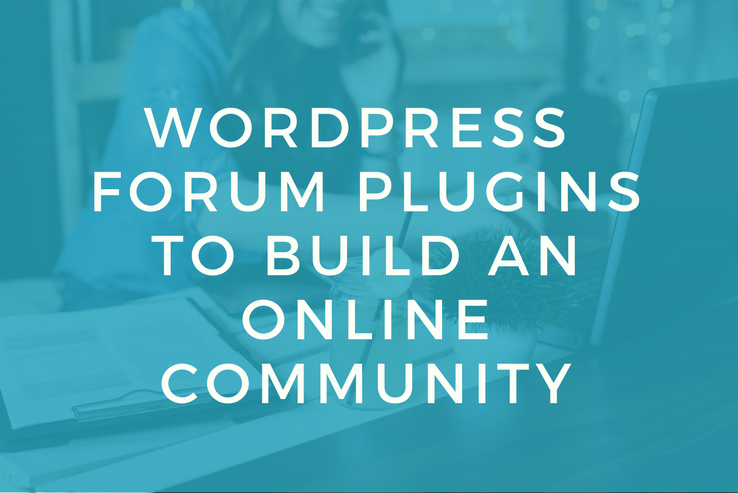 Check out some of the best forum plugins to transform your #WordPress website into an online community! Sites that discuss technical topics. Now that you have a pretty good idea about what forum plugins are and how you can use them on your WordPress website, let’s take a look at some of the best solutions you have at your disposal. In this section, we’ll run the rule over nine of the best forum plugins – both free and premium – for WordPress websites and highlight the standout features each one has to offer. By the time you’re done with this section, you’ll hopefully have a better idea of which plugin is right for you. Created by Automattic, bbPress is the most popular forum plugin for WordPress. And since it was created by the same people who made WordPress, you can rest assured that it will integrate seamlessly with your website. Once you have the plugin installed and activated, you’ll be able to manage your forum without having to leave the WordPress back-end. bbPress is an incredibly lightweight plugin designed with performance optimization in mind. The standout feature on offer with bbPress is that it puts ease of use and web standards center stage. The core plugin is available for free and when you want to kick things up a notch, you can pick from its wide-range of free and premium plugins to get access to advanced forum functionality. This also helps ensure that you’re using all of the extensions you have installed and nothing more. Easy to use, intuitive user interface. Comes with tons of free and premium extensions. Designed with performance optimization in mind. If you’re thinking about going all out with forums on your WordPress website then BuddyPress is the best plugin for the job. Although the BuddyPress plugin markets itself as a social media solution for WordPress, it has all the right features in place to add forum elements to your website. Similar to bbPress, BuddyPress is easy to use and even easier to extend thanks to the sheer number of premium-quality extensions that are available for it. And since BuddyPress is essentially a social media platform, it makes it even easier to build an online community with its built-in features. Allows users to register with your website and create profiles. Offers a platform for members to create and interact in groups. Easy to use and comes with a wide-range of extensions. DesignWall’s DW Question and Answer is a question and answer style forum plugin for WordPress that allows users to create sites like Stack Overflow and Quora. As the forum moderator, you’re able to fully manage individual questions, leave answers, and even comment on them. In addition to this, the DW Question and Answer plugin comes with built-in functionality to set up a voting system so that forum members are able to vote for the best answer. This feature-rich forums plugin comes with tons of powerful, useful features right out of the box such as sticky questions, reCAPTCHA, and email notification functionality. These features not only make the plugin more secure but also increase the user experience it delivers. Allows users to submit, order, filter, edit, and delete questions. Comes with a built-in email notification system. Allows users to make questions sticky. CM Answers is another question and answer style forum plugin for WordPress that transforms your forum page into a Stack Overflow-like page. And similar to Stack Overflow, the CM Answers plugin lets forum members post questions, allows other members to vote on answer and receive notifications, and makes it easy for the admin to moderate them. In addition to this, the plugin also lets forum members upload files from their drive and collaborate in a discussion board format. And as the forum admin, you can create as many forum categories as you’d like. Admins also have the power to customize every aspect of the forum and filter out any unwanted content. Allows admins to customize the forum and filter out unwanted content. Offers multiple file uploads, private messaging, and subscription functionality. Comes with a wide-range of premium add-ons and extensions. If you’re looking for a comprehensive forum plugin with the power to help you set up a question and answer system on your website then you should definitely consider AnsPress. AnsPress allows you to create a complete question and answer network on your site or integrate as a page within your existing site. This multi-language compatible plugin packs a number of premium-quality functionality including shortcode integration, reCAPTCHA, and email and push notifications. One of the best things about AnsPress is that it was created with performance optimization in mind so you can rest assured that it won’t slow down your site. The standout feature on offer with this plugin is that it allows the admin to feature questions and close questions. Allows forum members to post questions, set up a user profile, and answer questions. Integrates seamlessly with the BuddyPress plugin. Supports reCAPTCHA and email/push notifications. Although WP Symposium Pro is essentially a social media network plugin for WordPress, it comes with all the right features to help you set up and get started with a fully-functional forum. It’s built-in email alerts and profile creation functionality makes it a perfect fit for just about any kind of forum website. WP Symposium Pro makes it incredibly easy for all kinds of users to leverage its customization power. It allows admins to mess around with the modules layout, text, and buttons without having to code. On top of this, you can also explore its configuration settings page and shortcodes to further customize your forum pages. Tons of customization options right out of the box. Comes with a number of premium extensions to access advanced functionality. Allows forum members to create profiles and set up email alerts. Muut is a contemporary spin on the classic forum design. It allows website owners to create a modern-esque discussion platform on their WordPress website that is optimized for performance and highly scalable. Muut comes with features such as unlimited users, posts, threads, and comments. As far as design is concerned, Muut allows you to choose from two different commenting styles – flat or threaded – for your discussion topics. Additionally, this powerful plugin also comes with a number of useful features that will make your forum website deliver more value to its members including spam filtering, language support (for over 20 different languages), and email notifications. Comes with multiple widgets to display online users, latest comments, trending topics, discussion channels, and your feed. Allows users to customize pages using CSS. Optimized for performance and SEO from the get-go. SabaiDiscuss is a premium question and answer style plugin for WordPress that features a design layout similar to Stack Overflow and Yahoo! Answers. Aside from the question answer style setup, SabaiDiscuss also lets you create a discussion forum, a knowledge base, and a help desk portal within WordPress. One of the best features SabaiDiscuss has to offer is its built-in permission system that gives the admin complete control of the discussions posted on the forum. In addition to this, it also features a voting engine and comes with a report abuse module right out of the box. Allows forum moderators to review posts and take action without leaving WordPress. Built-in reputation engine allows forum members to earn reputation points based on the quality of their posts. Supports a code syntax highlighter, Markdown editor, social sharing tools, and widgets. Regardless of whether you’re thinking about setting up a private forum or a large, public discussion platform, SimplePress is the go-to solution. It’ll integrate seamlessly with your existing WordPress website and scale as your online community grows. As far as customization power goes, SimplePress is driven by a collection of themes and templates that make it incredibly easy for users to modify their site’s design. What’s more is that you can add on to its core functionality simply by installing premium extensions. Comes with powerful forum searching functionality, post moderation, and custom icons. Allows the admin to view forum stats and receive email notifications. Themes and templates allow users to modify the forums design. Having a forum can help you generate user engagement and deliver value to your site’s visitors by allowing them to interact with other members. Forum plugins make it infinitely easier for website owners to set up fully functional discussion spaces on their WordPress website. If you’re just starting out and looking for an easy-to-use forum plugin to get started with then bbPress is the best choice for you. However, if you’re thinking about setting up a question and answer style forum site should consider checking out the CM Answers plugin. Those of you who need access to advanced features and are willing to pay a premium should go for the SabaiDiscuss plugin. Which forum plugin are you leaning towards? Which features are most important for your website? Let us know by commenting below! Thanks for the great list…Will definitely help someone who’s looking to build a forum.